Well we’ve been MOT testing motorcycles in Mirfield for 15 years now! that’s probably hundreds of different bikes. All sorts of bikes have been in from sports bikes to Harley Davidsons and scooters to big trail bikes! We’ve met all sorts of different character of riders too, they’ve all got one thing in common……. they love riding their bike! 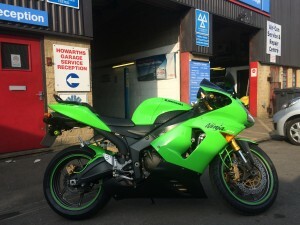 Most bikes are well looked after and maintained but the most common MOT failures are lighting faults, followed by worn or defective tyres and then braking faults. So it’s always worth checking these items before booking your motorcycle for MOT, but any repairs that need doing can be carried out by us. If your bikes needs tyres we can supply and fit those also. Don’t forget you can bring your motorcycle to our workshop in Mirfield up to one month before the MOT is due, this time can then be added onto your MOT. Let’s hope the weather keeps improving and we can enjoy some summer riding!